Today’s blog is from a guest blogger AJ Muldrew who is a graphic designer and pop culture commentator. 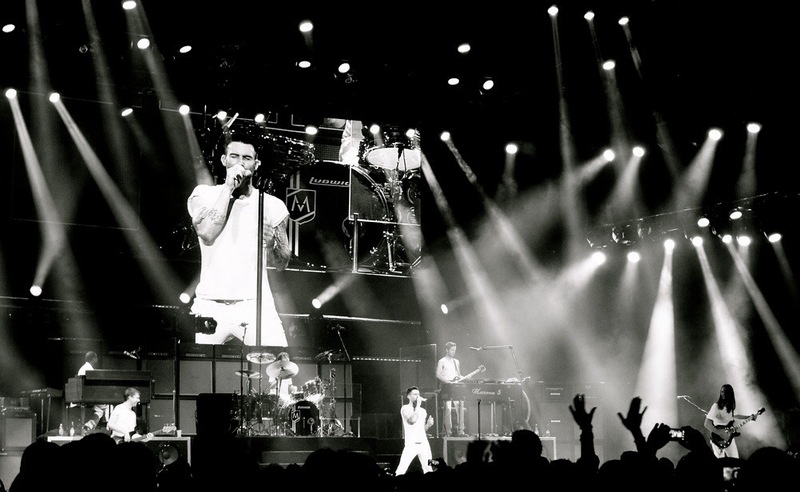 There is much to be said about the band known as Maroon 5. Fronted by the energetic Adam Levine and accompanied by James Valentine, Micky Madden, Matt Flynn and PJ Morton, the band returns this year with a fresh sound and setlist to rock the Oracle stage on September 25th. After four seasons on the hit television show, “The Voice”, Adam Levine has had a slight break from the musical spotlight. Diving into individual projects such as three fashion lines – Levine’s own “222” and collaborations with Sears and Kmart – a perfume line and an acting debut on ‘American Horror Story’. Now the band is back as a collective, returning to their roots to bring back the music that started it all. Following Levine’s hit collaboration “Moves like jagger” with fellow Voice coach, Christina Aguilera, which sold over 8.5 million copies worldwide and gained 165 million youtube hits, the band is back with a bang and a handful of hit singles including “Love Somebody”, “Payphone” and “One More Night”. If anybody ever questioned their sound in a newly pop and dubstep driven era of music, Maroon 5 has more than proven that they still have what it takes to stand their ground. With multi Grammy awards to their name, the band brings a 85 minute set to the Oracle stage, with a blend of both new and old music for an all ages show, sure to get you up and dancing amongst your busy Oracle schedule this year. Whether you’ve followed the band since their breakout multi-platinum selling album “Songs about Jane” from 2002, or you’ve only discovered them this year, the show promises something for everybody. With classic singles “This Love”, “Makes Me Wonder” and the crowd favorite “She Will be Loved”, The Honda Civic Tour provides enough singalongs to keep the whole company entertained. Filled with confetti, lasers and a few rogue beach balls, the band ensures a vocally driven performance with Levine’s vocals front and centre. Sure to be a fun-filled show, make sure you pen this one into your Oracle schedule this year. This is truly one show not to be missed.